Citation Information: J Clin Invest. 2007;117(4):1058-1067. https://doi.org/10.1172/JCI30982. Intravenous glucose tolerance tests in offspring of dexamethasone- and control-treated pregnancies. (A–C) Plasma glucose levels before (time = 0) and during an i.v. glucose tolerance test. Overall glucose clearance was affected by antenatal dexamethasone treatment (2-way ANOVA, F(3,244) = 4.4, P = 0.005). 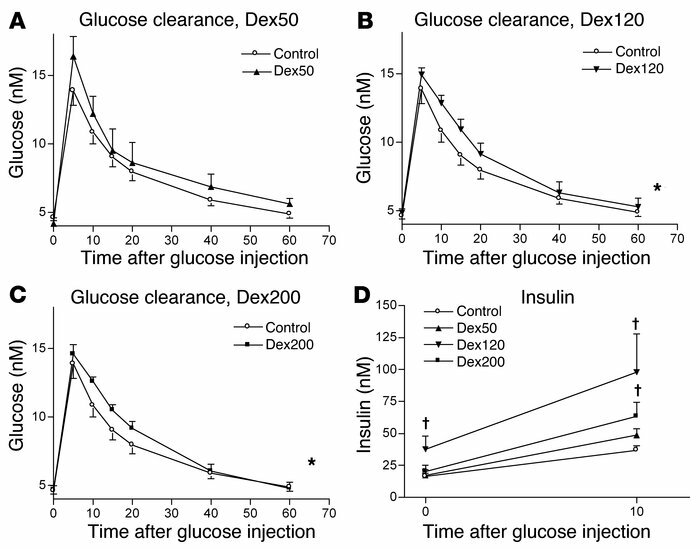 The glucose clearance was slower in the dex120 and dex200 offspring than in controls (post hoc testing, Fisher’s least significant difference method for factor, *P < 0.02 for dex120 and dex200; P = 0.051 for dex50). (D) Insulin levels of 8-month-old offspring before and 10 minutes after i.v. glucose administration. Basal insulin levels were increased in dex120 offspring (†P < 0.05 versus control; 2-tailed Student’s t test). At 10 minutes, plasma insulin was elevated in dex120 and dex200 offspring (†P < 0.05 versus control; 2-tailed Student’s t test).